February 4 marks the first day of spring in the Chinese solar (agricultural) calendar, the official start of the planting season and beginning of the year of the Yin Earth Boar (Ji Hai.) It falls on the halfway mark between the winter solstice and spring equinox and, in 2019, on the eve of the better know celebratory Lunar New Year and the second new moon. It commences 15 days of traditional celebrations around the world and the planet’s largest annual human migration as Chinese families return home. The seasonal influence of shifting energy on people and locations makes it a perfect time for change. How fitting to welcome the Yin Earth Boar (Pig) during this gathering season of new beginnings. 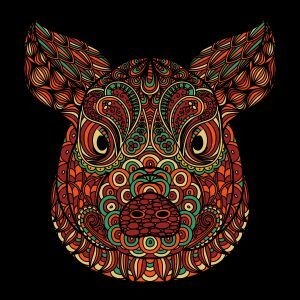 Poetically known as the ‘Boar in a Monastery – a vision of attainment’, the Earth Boar represents a shift from immovable yang energy of 2018 to more yielding yin energy this year. Boar is the last of the Chinese astrological animals in the twelve-year cycle symbolizing achievement, completion and conclusion. Chinese Metaphysics assigns the Boar to the Water element, the approach of winter, north/northwest compass direction and the final, quiet 9-11 PM hours of the day. She’s a tender-hearted optimist who exemplifies reflection, contentment and moderation. Kind and sensitive, Earth Boar is grounded in reality, the comforts of home and the security of family. These will be valued qualities in the coming year, absent for some time in the competitive race to control and accumulate. As the five elements pass through their natural order, the Wood (2014-2015) and Fire (2016-2017) years of growth and expansion are yielding now to a period of repose and restoration that focuses attention beneath the surface and closer to home. Just as the wise farmer rotates crops allowing the soil to lie fallow for a season to improve quality and fertility, 2019 will be a time to measure achievements and correct imbalances that have distracted the world from authenticity, stability and steady forward motion. For this reason, you can expect to see many changes this year politically, economically and environmentally. While predictions for each Chinese astrological sign are readily available during this busy new year season, the month, day and hour of your birth also play a larger role in determining your personal experience this and every year. This is your Four Pillars of Destiny or BaZi. Whether your drew first breath at midnight or midday, deep winter or early spring or on a day of Fire or Water will affect whether the Earth Boar advances, diverts or slows your goals this year. (Contact me if you’d like an analysis.) As in nature, shifting energies bring change and change requires adaptation. As you begin your journey this year, my wish as always is that you embrace your natural gifts, tread softly on the earth and move forward with the grace and confidence of the Earth Boar.